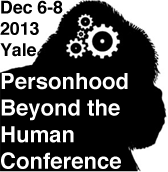 A conference on “Personhood Beyond the Human” will be held at Yale University, December 6-8, 2013. The event will focus on personhood for nonhuman animals, including great apes, cetaceans, and elephants, and will explore the evolving notions of personhood by analyzing them through the frameworks of neuroscience, behavioral science, philosophy, ethics, and law. The conference will be co-sponsored by the Yale Interdisciplinary Center for Bioethics and the Institute for Ethics and Emerging Technologies in collaboration with the Nonhuman Rights Project. Special consideration will be given to discussions of nonhuman animal personhood, both in terms of understanding the history, science, and philosophy behind personhood, and ways to protect animal interests through the establishment of legal precedents and by increasing public awareness. By the close of the conference, attendees will have gained an enhanced understanding of the neurological, cognitive, and behavioral underpinnings of personhood and those traits required for such consideration; personhood theory; the history of personhood consideration and status (both in terms of philosophical and legal conceptions); and the legal hurdles and requirements for granting personhood status outside of the human species. The Nonhuman Rights Project will be announcing the cases they will be launching to advance the cause of legal personhood for specific nonhuman animals. We’ll post more information, including how to attend the conference, as soon as it becomes available. Click Here to stay informed about conference details!